So seriously, the another month has passed, which means it's time to dive into my site analytics, and examine what you guys were up to. Each month, I share the most popular lessons on songs from my site, so that it may motivate you to practice more the following month. February usually starts seeing a drop off in new guitarist activity, since a lot of people who got guitars for Christmas, and started learning, start quitting as well. Sad, but true. Now let's have a look at the 5 most watched lessons on TheGuitarLesson.com in February. Let's start the list off with a classic from the man in black, Johnny Cash. This song doesn't usually make the list of top songs. Ring of Fire is a basic strumming song with simple chords, so it was pushed up by all of the new guitarists on the site. If you haven't learned it yet, make sure you do! If you are just starting out on the electric guitar, this song should be one of the first ones you learn. It will dramatically improve your alternate picking, and string jumping skills. Even if you've been playing for a while, but haven't learned this song yet, give it a go, and play it along with a backing track. 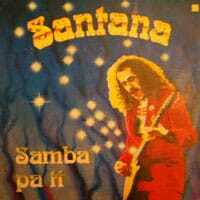 The music of Santana never gets old. This songs consistently scores very high in popularity on the site, lots of beginner electric guitarists choose to learn this song. For good reason! This one is definitely a constant favorite of my students. If I were to make an all time top list watched lessons list, this Spanish guitar lesson would definitely be on it. Chuck Berry is a staple of the top 5 list, which is very interesting for several reasons. His classic songs, which shaped modern day music, will live forever.